And no tongue can speak, neither can there be written by any man, neither can the hearts of men conceive so great and marvelous things as we both saw and heard Jesus speak. To his apostles in Jerusalem, Jesus explained “Blessed are the eyes which see the things that ye see: For I tell you, that many prophets and kings have desired to see those things which ye see, and have not seen them; and to hear those things which ye hear, and have not heard them” (Luke 10:24). This teaching underscores the great blessing it was for the New Testament apostles to have been in the physical presence of Jesus Christ. They personally witnessed the miracles of the Savior’s ministry and heard His sermons and teachings from His own mouth. Being in the Savior’s immediate presence is a profound blessing and a transformative privilege. Hence, the book of 3 Nephi is a very important and significant book of scripture. In this volume of sacred text, thousands of witnesses saw Jesus Christ, listened to his teachings, and individually felt his resurrected body. Those who experienced this great blessing bore record that “no tongue can speak, neither can there be written by any man, neither can the hearts of men conceive so great and marvelous things as we both saw and heard Jesus speak” (3 Nephi 17:17). Andrew C. Skinner has explained, “In a way, it picks up where Matthew, Mark, Luke, and John leave off and strengthens their messages. Even more significant, Third Nephi emphasizes the most important doctrines, principles, and themes found in the other Gospels.” As Jesus declared, “Verily, verily, I say unto you, that this is my doctrine, and whoso buildeth upon this buildeth upon my rock, and the gates of hell shall not prevail against them” (3 Nephi 11:39). Richard Lloyd Anderson has suggested that Book of Mormon “is a guidebook for our age because it collects foundational doctrines, and these are bound together in the central practice of partaking of the sacrament,” as portrayed in 3 Nephi. 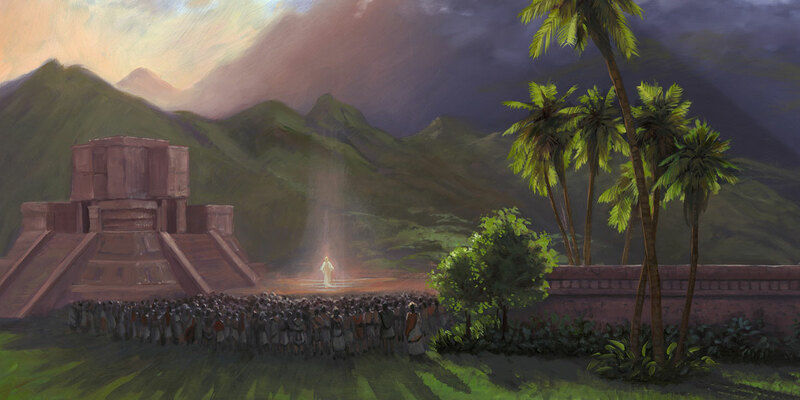 John W. Welch concluded that Christ’s sermon at the temple in Bountiful “restores covenantal and sacred meaning to the Sermon on the Mount,” and that in numerous ways 3 Nephi can be seen as opening to all people the blessings previously afforded only to the High Priest in the Holy of Holies. Many more enlightening studies have brought forth an abundance of noteworthy insights. The argument he is setting up seems to equate the signs among the Nephites of Christ’s birth with the sign of the coming forth of the Book of Mormon. [In both cases] these [signs] are preliminary warnings, which will be followed by a brief probationary period and then the destructions accompanying Jesus’ death will have their counterpart in the devastation that will take place at the Second Coming. Though terrifying and tremendous, these upheavals herald the dawning of a clearer, brighter, and lustrous day. During the final scenes leading up to the Savior’s visitation at the temple in Bountiful, the “people began to look with great earnestness for the sign which had been given by the prophet Samuel, the Lamanite” (3 Nephi 8:3). In modern times, prophets and apostles have similarly encouraged people to study the signs of the Lord’s coming and to anxiously prepare for His exquisite arrival. Elder Neil L. Andersen remarked, “The thought of His coming stirs my soul. It will be breathtaking! The scope and grandeur, the vastness and magnificence, will exceed anything mortal eyes have ever seen or experienced.” Elder Andersen further invited, “May we prepare for His coming by rehearsing these glorious events over and over in our own minds.”  Christ’s resplendent visitation at the temple in Bountiful can help readers better understand and anticipate what it means for Him to come again. Yet 3 Nephi is far more than a key to discerning the signs of the times. It was written to help individuals, communities, and nations prepare themselves and to be refined, cut, and polished, to enter into the presence of the Lord. Elder Dallin H. Oaks has stated that “the faithful are taught to study the signs of [the Second Coming] and to be prepared for it” (emphasis added). Andrew C. Skinner, Third Nephi: The Fifth Gospel (Springville, UT: Cedar Fort, 2012). Andrew C. Skinner and Gaye Strathearn, eds., Third Nephi: An Incomparable Scripture (Salt Lake City and Provo, UT: Deseret Book and Neal A. Maxwell Institute for Religious Scholarship, 2012). Monte S. Nyman and Charles D. Tate, eds., The Book of Mormon: 3 Nephi 9–30, This Is My Gospel (Provo, UT: Religious Studies Center, Brigham Young University, 1993), 137–148. Several scriptures emphasize the importance of the words that proceed directly from the mouth of the Lord. See Moses 6:30; Genesis 17:12; Moroni 7:23; Doctrine and Covenants 21:5; 29:29. Mormon assured readers that “we know our record to be true, for behold, it was a just man who did keep the record” (3 Nephi 8:1, cf. 3 Nephi 5:18). See Book of Mormon Central, “Why Did Mormon Introduce Himself in 3 Nephi 5? (3 Nephi 5:12),” KnoWhy 194 (September 23, 2016). See also, Book of Mormon Central, “Why Did Jesus Minister to the People One by One? (3 Nephi 17:21),” KnoWhy 209 (October 14, 2016); Kevin L. Tolley, “To ‘See and Hear,’” Interpreter: A Journal of Mormon Scripture 18 (2016): 139–158. Skinner, Third Nephi: The Fifth Gospel (Springville, UT: Cedar Fort, 2012), 2. Victor L. Ludlow, “Jesus’ Covenant Teachings in Third Nephi,” in Rediscovering the Book of Mormon: Insights You May Have Missed Before, ed. John L. Sorenson and Melvin J. Thorne (Salt Lake City and Provo, UT: Deseret Book and FARMS, 1991), 185. See also, Victor L. Ludlow, “Covenant Teachings of the Scriptures,” devotional address delivered at Brigham Young University, October 1998, online at speeches.byui.edu; Victor L. Ludlow, “The Father’s Covenant People Sermon: 3 Nephi 20: 10–23:5,” in Third Nephi: An Incomparable Scripture, ed. Andrew C. Skinner and Gaye Strathearn (Salt Lake City and Provo, UT: Deseret Book and Neal A. Maxwell Institute for Religious Scholarship, 2012), 147–174. Gaye Strathearn and Jacob Moody, “Christ’s Interpretation of Isaiah 52’s ‘My Servant’ in 3 Nephi,” in An Incomparable Scripture, 175–190. Robert L. Millet, “The Praying Savior: Insights from the Gospel of 3 Nephi,” in An Incomparable Scripture, 131–146. See also, Donald W. Parry, “‘Pray Always’: Learning to Pray as Jesus Prayed,” in The Book of Mormon: 3 Nephi 9–30, This Is My Gospel, Book of Mormon Symposium Series, Volume 8, ed. Monte S. Nyman and Charles D. Tate (Provo, UT: Religious Studies Center, Brigham Young University, 1993), 137–148. Charles Swift, “‘So Great and Marvelous Things’: The Literary Portrait of Jesus as Divine Lord in 3 Nephi,” in An Incomparable Scripture, 235–260. Jerry L. Jaccard, “The End from the Beginning in 3 Nephi and Beyond: The Words of Christ as Musical Architecture,” in An Incomparable Scripture, 353–372. Richard Lloyd Anderson, “Religious Validity: The Sacrament Covenant in Third Nephi,” in By Study and Also by Faith: Essays in Honor of Hugh W. Nibley, 2 vols., ed. John M. Lundquist and Stephen D. Ricks (Salt Lake City and Provo, UT: Deseret Book and FARMS, 1990), 2:1–51. John W. Welch, The Sermon at the Temple and the Sermon on the Mount (Salt Lake City and Provo, UT: Deseret Book and FARMS, 1990), 87–88. See also Book of Mormon Central, “Why Did Jesus Deliver a Version of the Sermon on the Mount at the Temple in Bountiful? (3 Nephi 12:6),” KnoWhy 203 (October 6, 2016). John W. Welch, “Seeing Third Nephi as the Holy of Holies of the Book of Mormon,” Journal of the Book of Mormon and Other Restoration Scripture 19, no. 1 (2010): 36–55. See also, Book of Mormon Central, “What Makes 3 Nephi the Holy of Holies of the Book of Mormon? (3 Nephi 14:13-14; Matthew 7:13-14),” KnoWhy 206 (October 11, 2016). See Nyman and Tate, eds., The Book of Mormon: 3 Nephi 9–30; Skinner and Strathearn, eds., Third Nephi: An Incomparable Scripture. Benson, “The Savior’s Visit to America,” online at lds.org. Ezra Taft Benson, “The Book of Mormon—Keystone of Our Religion,” Ensign, November 1986, online at lds.org. Grant Hardy, Understanding the Book of Mormon: A Reader’s Guide (New York, NY: Oxford University Press, 2010), 317 n. 50. Neil L. Andersen, “Thy Kingdom Come,” Ensign, May 2015, 122, online at lds.org. Dallin H. Oaks, “Preparation for the Second Coming,” Ensign, May 2004, online at lds.org. Welch, “Seeing Third Nephi as the Holy of Holies,” 53. Gaye Strathearn, “Nephi, third book of,” in Book of Mormon Reference Companion, ed. Dennis L. Largey (Salt Lake City, UT: Deseret Book, 2003), 597.